Lalitaditya Muktapida! Not many except few have heard about this great king of Kashmir from the 8th century. He was one of the bravest kings of India who resisted attacks by Arabs. Junaid, the Arab governor of Sindh, attacked Kashmir following the orders of Caliph Hisham. Lalitaditya defeated Junaid and thus the Arab attempt of plundering Kashmir failed. He subjugated the Turks by attacking their territories. He also defeated the Tibetans, who were then very strong. He built the famous Martand Sun temple. This temple is the only surviving structure that speaks volume about this great emperor from Kashmir. Do you know Lalitaditya Muktapida had one of the biggest empires in world history? But it was short lived. It was more of a military expedition. He was able to subjugate kings of regions ranging from Afghanistan and Punjab, major parts of Haryana and Uttar Pradesh to Bengal, Bihar, and Orissa in the east. In the south, he helped Rashtrakuta queen Ratta also known as Bhavagana, the mother of Dantidurga, with an army to maintain her supremacy from rivals. It was Ratta who sought Lalitaditya’s help, and thus started friendly relations between the two regions of the north and south. In the west, Lalitaditya invaded Kathiawad. In short, his empire was almost twice the size of the Mughal empire, but it didn’t last long. His empire shrinked after his death. He also defeated Momin of Bukhara (Uzbekistan) and subdued the Turks and Tibetans. Lalitaditya Muktapida was the most powerful of the rulers of the Kartoka dynasty. According to the chronicled account of Kashmiri historian Kalhana’s Rajatarangini, Lalitaditya’s rule lasted for 36 years, 7 months and 11 days. Rajatarangini, which consists of 7826 verses in eight parts (books) in Sanskrit, happens to be the only major source of chronicle of the rulers of Kashmir and its neighbors in the north western parts of India preceding 12th century. Later historians and ethnographers rely on this book for details of Kashmiri kings and their times. Rajatarangini contains a detailed account of Lalitaditya Muktapida, though numerous historians claim much of the chronology and events described as exaggerated. Durlabhvardhana, a contemporary of Raja Harsha of the Vardhana dynasty, founded Kartoka dynasty in 625 CE. Lalitaditya Muktapida, contemporary of Yashovarman, was the fifth Kartoka king and the great grandson of Durlabhvardhana. He was born as the youngest son to Raja Durlabhaka, who was also known as Pratapaditya and Rani Narendraprabha. 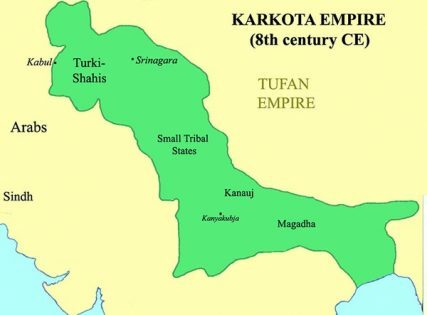 Before he ascended the throne of Kashmir, his elder brothers Vajraditya, also known as Chandrapida and Udayaditya, also known as Tarapida, were kings respectively. According to Rajatarangini, Lalitaditya ruled from 700 to 736 CE. Modern historians date his reign to the period from 724 to 760 CE. The dating may differ by a few years, but events are true. A German art historian Hermann Goetz from the 20th century has claimed that events described in Rajatarangini by Kalhana about Lalitaditya Muktapida is true. Contemporary historian André Wink supports Goetz’s statement. But Marc Aurel Stein, a Hungarian-born British archaeologist from the later 19th and early 20th centuries, considers few military campaigns of Lalitaditya to be true and few to be false. A professor at several Indian universities, Stein first translated the Rajatarangini into English. Our focus in this article is not about Lalitaditya’s military expeditions in other kingdoms of Bharat, but his expeditions and victories against foreigners, especially Tibetans, Arab forces, and Turkish Muslims. Indian kings did involve in war against one another for expansion of empire and for supremacy. But they followed rules of Dharma in warfare contrary to what Islamic invaders followed. Indian kings avoided fighting with an opponent already engaged in a fight with another. They avoided stabbing from behind or hitting below the navel. They took care of the injured at the end of the day. They considered women, prisoners of war, and farmers as sacred. They never pillaged the land or destroyed standing structures in enemy lands. They were merciful if enemies asked for pardon. But Islamic invaders did the opposite of these very rules of Dharma followed by Hindu kings in warfare. 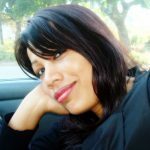 They followed the tactics of treachery, deception and cruelty. They plundered kingdoms, pillaged land, killed the weak and innocent, raped women and took them as slaves, stabbed warriors from behind, destroyed standing structures and temples, and what not! Converting the defeated people to Islam was one of their key strategies. They did this wherever they set their foot in India. The Chinese emperor was then busy quelling a rebellion; hence the proposal wasn’t accepted. Lalitaditya single handedly subjugated the Tibetans. According to Kalhana, Kashmiris annually celebrated Lalitaditya’s victories. As per Alberuni, one of the greatest scholars of the medieval Islamic period, Kashmiris observed the second of Chaitra as a day of Lalitaditya’s victory over the Tibetans. Junaid, the Arab governor of Sindh, attacked Kashmir following the orders of Caliph Hisham. After the death of Muhammad, four major caliphates were established. Umayyad was the second of the caliphhates; they hailed from Mecca. Hisham was the 10th Umayyad Caliph. The Arabs had established their rule over the Hindu regions of Sindh after Muhammad bin Qasim led an Umayyad force and defeated Raja Dahir in 711. Thereafter, Hindu chiefs rose in rebellion in Sindh. Hisham sent armies to end the Hindu rebellion, and he was successful. The Umayyads reasserted their rule over major portions in Sindh and lower Punjab, which were once ruled by Hindus. Muhammad bin Qasim was also on an expedition of attacking Kashmir. Lalitaditya’s elder brother Chandrapida was then the ruler of Kashmir. Chandrapida sought military aid from the Chinese, but did not receive any help. Fortunately, the Ummayad Caliph called back Qasim to Damascus. Hence, during Lalitaditya’s reign, the Ummayad Caliph sent armies to attack Kashmir again. Lalitaditya Muktapida defeated Junaid and thus the Arab attempt of plundering Kashmir failed. Junaid also attacked North India, but failed in this expedition. Besides, Lalitaditya Muktapida defeated Momin of Bukhara (Uzbekistan), the heart of the Persian civilization, located in the Silk Route and expanded his territory near the banks of the Caspian Sea. Lalitaditya was never satisfied with his conquests and victories. He wanted to subjugate more territories. It was during one of his new expeditions that he lost his life. According to Kalhana, it was a distant expedition on the north that brought his end. There are two versions to the king’s death. According to one version, Lalitaditya perished through excessive snow in Afghanistan. As per another version, he was separated from his army during one of the expeditions. As he was all alone in a difficult mountaineous terrain, he committed suicide to avoid being captured. Lalitaditya Muktapida is counted among the greatest kings of Kashmir. He not only protected his subjects but also patronized art and crafts and different branches of learning. He looked after the welfare of his subjects. He was the first Kashmiri king to clear the bed of the Baramula river of rocks and silt to control recurring floods. Swamps and other uncultivated lands were reclaimed for purposes of cultivation. He facilitated irrigation. Kashmir thus prospered under him though he went on regular military expeditions. According to Kalhana, Parihasapura city became Lalitaditya’s residence for a brief period, while Srinagara continued to serve as the other capital. There are three major sun temples in India – Modhera Sun Temple built by Raja Bhima I of the Chaulukya dynasty in 11th century, Konark Sun Temple built by Raja Narasimhadeva I of the Eastern Ganga Dynasty in 13th century, and Martand Sun Temple built by Raja Lalitaditya Muktapida in 8th century. Martand Sun Temple with a primary shrine in its center surrounded by 84 smaller shrines, is the oldest of the shrines. 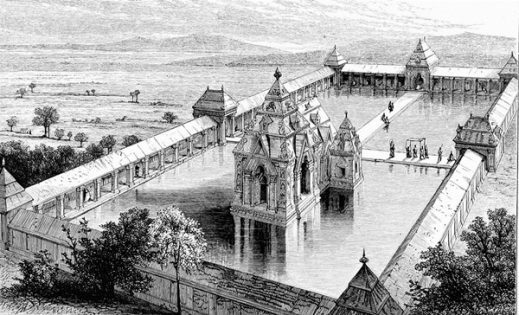 The Kashmir king also built several other temples and learning centres in Kashmir. But these could not stand destruction by Islamic invaders and the ravages of time. Under the orders of Sikandar Butshikan, Martand temple was destroyed completely. Such was the grandeur and strength of the temple that it took two years for Butshikan’s men to destroy it! Sadly this 1300 plus year old temple is still in ruins today! 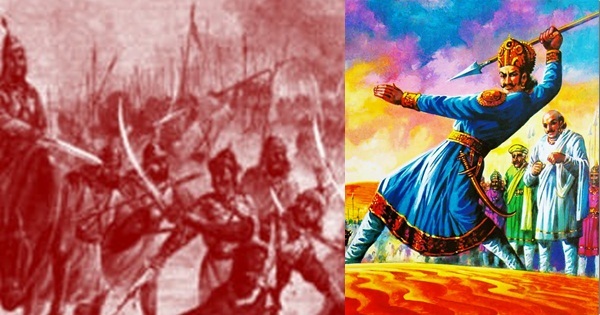 Salute to Lalitaditya Muktapida, the forgotten king of Kashmir! Featured image courtesy: Amar Chitra Katha and ptcnews.tv. 5. Foundation of the Sultanate, Sodhganga.